1. Put the lychees, yuzu juice, mint and ginger in a cocktail shaker and muddle until the lychees are broken down. 2. Add the coconut water and ice cubes and shake vigorously. 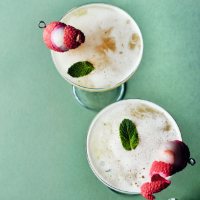 Strain into two chilled martini glasses and garnish each with a whole lychee on a skewer, part-peeled into a curl.